By now, Armie Jarin-Bennett, who was recently promoted president of Nine Media Corporation, has been heading CNN Philippines for more than a year. After some twists and turns, reorganization and restructures, the local CNN station has finally found its footing, as well as audience, this last election season, staging one of the most expertly produced live debates in Philippine television. Still, by comparison, the network remains the David to the Goliaths of the local television news industry, namely GMA News and ABS-CBN News, with its newsroom evidently understaffed, if not underfunded. But the network bosses have been beefing up its roster of talents, hiring two established broadcasters this year alone — ABS-CBN anchor Pinky Webb and GMA-7 reporter Ruth Cabal — while continuing its headhunting following the departures of Karen Jimeno, Menchu Macapagal and Gani Oro. 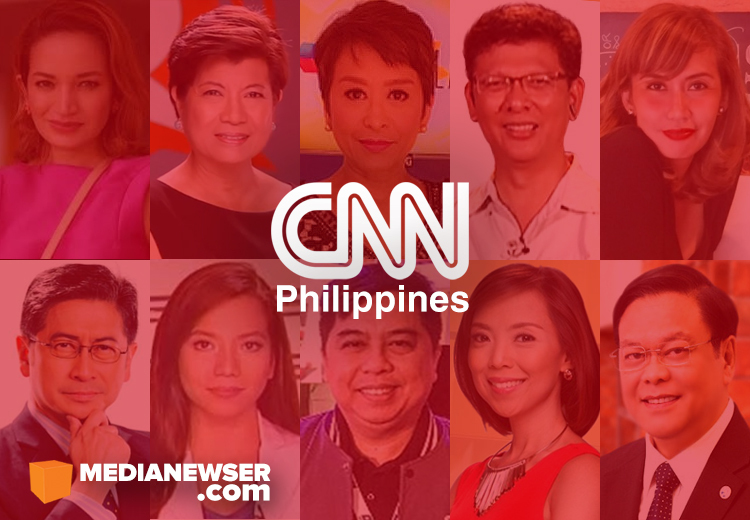 For our brand new listicle, we'd like to offer this space to name 10 broadcasters who we believe should be considered by Ms. Jarin-Bennett and her management team for top posts at CNN Philippines. When there is a major news event in South East Asia, there's Jamela Alindogan. A longtime correspondent for Al Jazeera English, Alindogan has developed a reputation as a fearless journalist — one who will venture into some of SEA's most dangerous territories to report a story. Since joining the international 24-hour news channel in 2008, Alindogan has covered the elections in Indonesia and Malaysia, the protests in Vietnam and Cambodia, the coverage of supertyphoon Yolanda, and the hostage siege in Zamboanga in 2013, among others. An alum of the ABS-CBN News Channel, Alindogan would be a perfect fit to CNN Philippines given her experience in covering global news stories. In her more than three-decade career in television, Lazaro had been to GMA-7 and TV5 before settling comfortably to Probe Productions' TV home, ABS-CBN. What better way to bookend an illustrious broadcasting career than to join a fast-growing internationalized network. Lazaro will not only bring her skill set to the table, but also decades of journalistic excellence to a news brand known for its journalistic integrity. An ideal setup/format for her at this point: a monthly television special where she can conduct a thorough "probing" interview with some of the country's leading newsmakers. Speaking of The Probe Team, no other journalist can work hand in hand with Lazaro, or any big-name journalist, better than Eliza Zamora-Solis. Zamora-Solis, who had a reportorial stint at the once-promising News5, remains one of the most prolific program producers of the last decade, having been the brains behind some of the highest rated and critically acclaimed programs on GMA-7 such as I-Witness, Case Unclosed, Bayan Ko; and TV5 — Insider and Journo. There is plenty of room for CNN Philippines to grow and things would be much more easier for Jarin-Bennett if she has someone like Zamora-Solis who can help her find ways to produce high-quality and premium content that is complementary to such an important news brand that is CNN. Practically, a journalist like Jasmin Romero would be a good addition to CNN Philippines. Not only can she do the news fluently in both Filipino and English, she has also proven time and time again that she is also capable of doing on-site reporting and live interviews — quite fitting to Jarin-Bennett's vision of expanded coverage of breaking news stories and live events. Her familiarity with digital media and her strong online following — as seen on her frequent Facebook Live broadcast — would also be put into good use given the network's evergrowing use of new media in their newsgathering operations. Since the network reformat in August, Atty. Mel Sta. Maria has been off the radar, mainly devoting his time on Relasyon — the radio program he is co-hosting with News5 chief Luchi Cruz-Valdes. Sta. Maria is the kind of broadcaster who would be an asset to any news organization. He can not only serve as the go-to analyst on all sorts of issues, or the inquisitive interviewer — as seen on his one-on-one with former President Noynoy Aquino in 2014 — he can also pilot a program or coverage on his own, as seen on Aksyon sa Umaga and the much talked about PiliPinas pre-debate show. Sta. Maria technically has no television home at the moment, and sources connected to him told Media Newser Philippines that such an offer to join CNN Philippines (or any other network), would possibly appeal to him. Tony Abad is without question the best among the current anchor-host lineup of the business news channel Bloomberg TV Philippines. His focused and tenacious line of questioning on his program Political Capital makes every interview — whether that be with politicians like Rodrigo Duterte or Leni Robredo or a propagandist like Mocha Uson — an appointment television. If there's anyone qualified to succeed former New Day host Atty. Karen Jimeno as one of CNN Philippines' in-house legal analysts, it's no other than Atty. Abad. With her experience and name ID, CNN Philippines could easily turn to one of pillars of ABS-CBN News, Ces Oreña-Drilon. Hiring the widely recognized and respected Bandila anchor will not only add credibility to its anchor team, but it could also give the network some media attention by nabbing an established name from a competitor. Kapamilya insiders told us that she is still under contract and it's unlikely that she'll consider a big move at this point in her television career. But maybe (and just maybe) a lucrative offer in the very near future — with a chance to work with her former colleague Pinky Webb — would make the temptation irresistible. TV5 has been perceived by some as a pro-Duterte network with its coverage seemingly in favor of the current Philippine president especially during the campaign season. In a network facing such accusations, Ed Lingao remains one of the few who would challenge that notion — holding President Duterte, or any other public figures, accountable for the policies or dangerous rhetoric they're espousing. From his explainers on Aksyon Tonite to his commentaries on his Facebook account, Lingao has consistently proved he is no corporate minion and that he is here to serve the public with his reporting and fact-based analysis. Veteran journalist Jove Francisco won't probably leave his perch at ABS-CBN News — where he currently serves as Tina Monzon-Palma's executive producer on the long-running The World Tonight — but maybe a reunion with his longtime TV partner, Chi Bocobo, will change his mind. It's an intriguing idea that Jarin-Bennett and her team should consider. Francisco, who joined ANC last year after a decade-career at TV5, is one of the sharpest minds in political journalism while Bocobo, who was last seen on TV via AksyonTV's Balitang 60, fits the bill of someone they would want to hire as anchor-correspondent. If they can get these two back together in one program, it will surely be a match made in TV heaven. Feel free to post your comments below if you have specific candidates you would want to see on the network. You can also post it on our Facebook page or tweet us @medianewserphil.